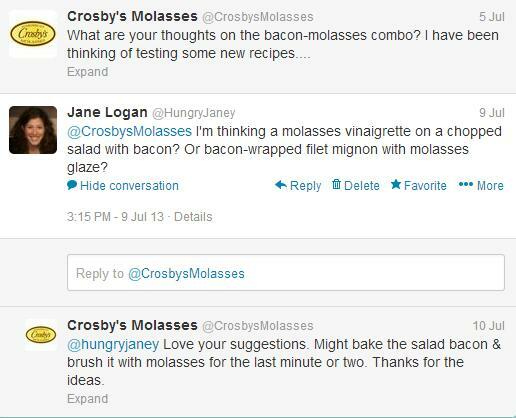 I hadn't thought about putting molasses and bacon together until I saw Crosby's tweet. Once I wrote them a quick reply with my initial ideas, I knew I had to jump on the bandwagon. The secret to a great kale salad is a little extra time and a little extra love. Or, to put it simply, massage the dressing into the kale about 30 minutes before assembling the rest of the salad. It gives the kale a chance to soften up, and makes for a great salad! This salad was UNREAL. We had it with teriyaki salmon, and Josh acted like he died and went to heaven. You've go to try it! Place olive oil, lemon juice, white wine vinegar, and molasses in a large bowl. Whisk to combine. Remove kale leaves from rib, and tear into bite-sized pieces. Place on top of dressing in bowl. With your hands, massage the dressing into the kale. Allow to sit in the refrigerator for for 20-30 minutes. Add bacon, walnuts, and peppers. Sprinkle with coarse salt and toss to combine. I admit that the photos above were staged. We took this meal on a picnic for our anniversary last night, so I actually enjoyed eating this kale salad as pictured below. Can't beat it! Jane, I love kale salad and this looks amazing! I can't wait to try it. Let me know how you like it! We loved it. I mixed the kale with the dressing again last night and had it on a sandwich with grilled chicken. It was such a great meal with so little effort! Love that you have shared a salad idea. I have a thing for a good salad. I’ll be trying this soon-thanks!